I'm so excited to share this finished project with you. I found the tutorial on Kellie's website: Don't Look Now. I fell in love with her style the moment I laid eyes on her site. 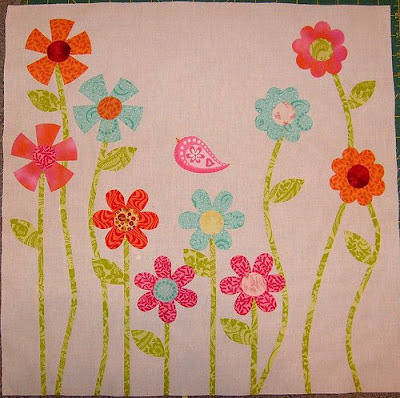 How awesome is it that she shared the pattern and tutorial for free? Well the moment she posted the tutorial I knew I had to make one. In fact I went out and bought the material when she announced she would be sharing the pattern. I started on Jan 5th and finished yesterday evening (Jan 13th.) So it took me little over a week to finish this project. It would have been done sooner if it wasn't for little things like sleeping, cleaning, cooking, and toddlers to get in the way! Actually I'm surprised I was able to finish so quickly. I had a few set backs such as not having the right free motion foot for my machine. I ended up using my brother 270d because I was able to get the tension set up better than on my Kenmore. However when I started practicing I realized I would have to go and get a clear free motion foot as opposed to the metal one that came with the machine for the embroidery function. So here are the progress pics and don't forget to go over to Kellie's site so you can make your own pillow. 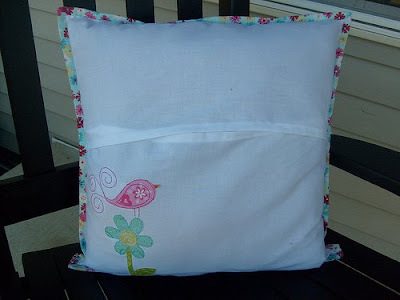 One note, the tutorial is for a 20x20 pillow, I made mine 18x18 since I already had a pillow lying around. So I cut my panels 18.5"x18.5"
Here is the front panel all squared up after I completed all the free motion quilting. Everything but the stems was done free motion. Here is a picture of the back front panel. As you can see my free motion skills are very "sketchy" at this point. It helps to have a larger area than just the machine throat to work on. So either get an extension table for your machine or use some flat hardback books behind and to the left of the machine. Use light fusible web otherwise your needle will not got through the heavy stuff. 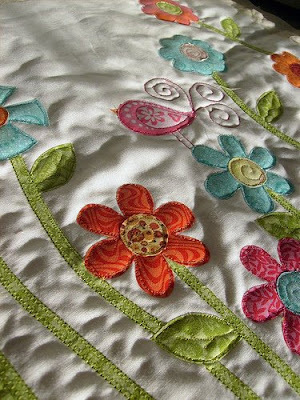 I used this method by Sharon Schamber for doing the binding by machine. 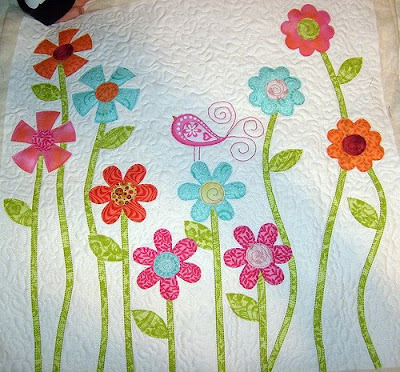 The video shows bias binding but I used straight grain binding. It seems tedious but I got perfect results and I was done in 1 afternoon, otherwise I'd still be slip stitching the binding on as we speak! You did a wonderful job on your pillow! This was one of my favorite patterns to make. 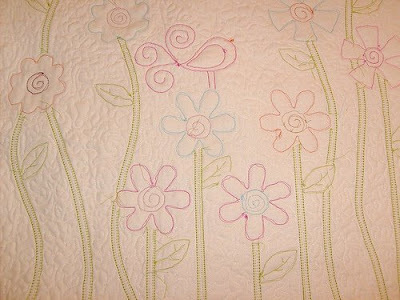 Your free motion quilting is great! this is such a lovely pillow!! 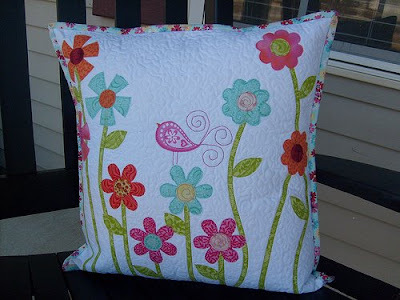 i love how you added the free motion quilting to the pillow. Wow! The pillow is so beautiful, so gorgeous. You did an great job. Will try it out soon. Thanks so much for sharing.